For Prelims and Mains: About Maharshi Badrayan, contributions and awards, what is Vedanta philosophy? Why in News? Vice President recently conferred around 100 ‘President’s Certificate of Honour’ and ‘Maharshi Badrayan Vyas Samman’ Awards to scholars in Classical Languages. For Prelims and Mains: World Health Day, theme and significance, challenges to UHC and the need for international cooperation. Context: April 7 of each year marks the celebration of World Health Day. This year’s World Health Day will focus on equity and solidarity. Theme of World Health Day 2019 is Universal Health Coverage: Everyone, Everywhere. Universal health coverage (UHC) is about ensuring all people and communities have access to quality health services where and when they need them, without suffering financial hardship. It includes the full spectrum of services needed throughout life—from health promotion to prevention, treatment, rehabilitation, and palliative care—and is best based on a strong primary health care system. For Prelims: About ADB and key findings in the report. For Mains: India’s position- concerns, reasons and reforms needed. 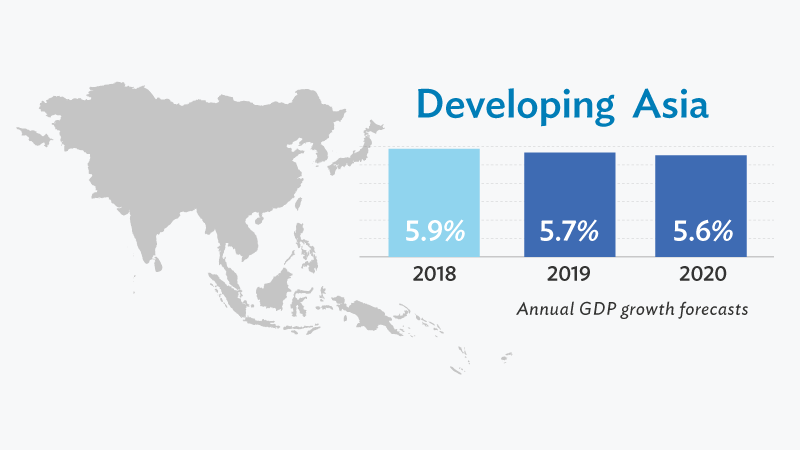 Context: ADB publishes Asian Development Outlook 2019. Established on 19 December 1966. It is modelled closely on the World Bank, and has a similar weighted voting system where votes are distributed in proportion with members’ capital subscriptions. For Prelims and Mains: What was Hawking’s theory, what are the recent findings and their significance? Gravitational lensing. Context: A group of scientists have ruled out Stephen Hawking’s theory for mysterious dark matter. Stephen Hawking proposed a theory that primordial black holes are a source of dark matter. He computed that the mass of the primordial black holes could range from as low as one-hundredth of a milligram to as high as more than the mass of a thousand Suns. What are primordial black holes? Two Soviet physicists, Yakov Borisovich Zel’dovich and Igor Dmitriyevich Novikov, showed that at the initial instant of the big bang, the densities would have been very high at many points, resulting in the formation of small black holes. They were named `primordial black holes’. For one whole night, the research team took 190 consecutive images of Andromeda galaxy. If the Universe is filled with invisible teeny weeny primordial black holes, with masses lighter than the moon, as postulated by Stephen Hawking, then the team should have seen at least 1,000 gravitational lensing events. However, they were able to see at most one such candidate event, if not none. This implies Prof Stephen Hawking’s theory that such black holes make up all of dark matter is wrong. In most galaxies, the stars closer to the centre and the stars at the edge of the galaxies take almost same time to make one revolution. This implied that something invisible and enveloping the galaxies was giving an extra push to the outer stars, speeding them up. This entity has remained as one of the central unresolved puzzles in cosmology since 1930s. It is named `Dark Matter’. Composition: Almost 85% of the total mass of the Universe is composed of dark matter. For Prelims and Mains: Key findings of the report, concerns and measures needed to control air pollution. Context: Two US based institutes Health Effects Institute (HEI) and Institute for Health Metrics and Evaluation (IHME) recently released a detailed report on quality of the global air with title, “State of Global Air-2019”. In 2017, exposure to PM 2.5 pollution was found to be the third leading risk factor globally for Type 2 diabetes. The economic costs of diabetes are substantial — estimated as 1.8% of worldwide gross domestic product in 2015 and pose a growing challenge to health care systems in countries at all levels of development. Type 2 Diabetes represents a substantial, growing, and costly health burden. In 2017, the disease accounted for more than 1 million deaths globally and burdens have increased by 175% and 141%, respectively, since 1990. There is a strong inverse relationship between a country’s level of social and economic development and the PM2.5 exposures experienced by its population; that is, less developed countries suffer PM2.5 exposures that are four to five times those of more-developed countries. In 2017, annual PM2.5 exposures were highest in South Asia, where Nepal, India, Bangladesh and Pakistan had the highest exposures. Bhutan’s exposure level was the lowest in the region but was still above WHO’s first interim target. The 10 countries with the lowest national PM2.5 exposure levels were the Maldives, United States, Norway, Estonia, Iceland, Canada, Sweden, New Zealand, Brunei, and Finland. Air pollution collectively reduced life expectancy by 1 year and 8 months on average worldwide, a global impact rivaling that of smoking. 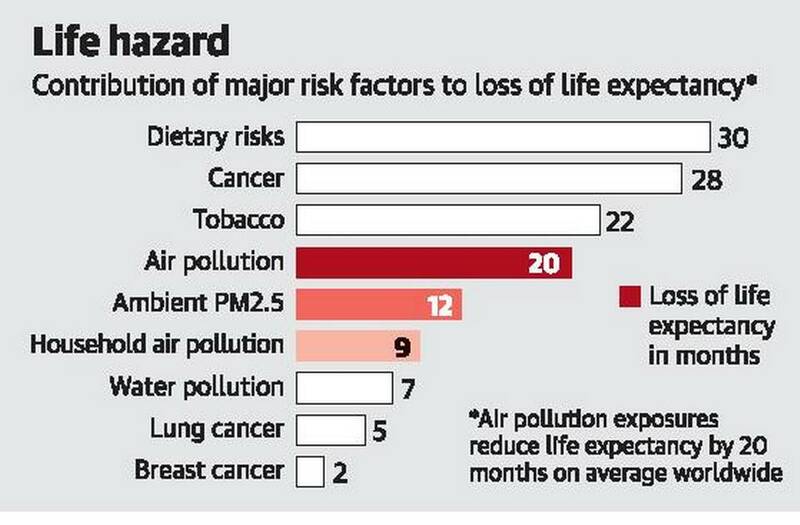 This means a child born today will die 20 months sooner, on average, than would be expected in the absence of air pollution. India and China are collectively accounted for more than 50% of global 5 million deaths due to air pollution. Major PM2.5 sources in India include household burning of solid fuels; dust from construction, roads, and other activities; industrial and power plant burning of coal; brick production; transportation; and diesel-powered equipment. An estimated 846 million people in India (60% of the population) and 452 million people in China (32% of the population) were exposed to household air pollution in 2017. What has India done to reduce household emission? A sweeping government effort seeks to shift more households to liquefied petroleum gas (LPG) instead of biomass fuels. While many families can afford subsidized LPG fuel, the fee for installing a household LPG hookup can be prohibitive. The government initiative, known as Pradhan Mantri Ujjwala Yojana (PMUY), provided LPG connections to 35 million poor families free of charge between 2016 and early 2018 and aims to provide 80 million connections by 2020. For Prelims and Mains: About the coalition- objectives, significance and functions. Context: The first-ever global coalition on clean and efficient cooling was launched at the recently held First Global Conference on Synergies between the 2030 Agenda and Paris Agreement in Copenhagen, Denmark. Objective: It is expected to inspire ambition, identify solutions and mobilise action to accelerate progress towards clean and efficient cooling. Supporters: Besides the UN, it is supported by the Climate and Clean Air Coalition, the Kigali Cooling Efficiency Program and Sustainable Energy for All (SEforALL). Composition: It includes government officials from Chile, Rwanda, Denmark as well as leaders from civil society, research and academia. For Prelims and Mains: GIAN Program- objectives, significance and features. Context: The National Institute of Technology, Tiruchi, had launched a programme under the Global Initiative of Academic Networks (GIAN) in Higher Education, aimed at tapping the talent pool of scientists and entrepreneurs. Aim: GIAN aims at tapping the talent pool of scientists and entrepreneurs to engage with the institutes of higher education in India to augment the country’s existing academic resources, accelerate the pace of quality reforms, and further strengthen India’s scientific and technological capabilities. To create avenue for possible collaborative research with the international faculty. Context: UAE awards PM Narendra Modi with Highest Civilian Honour. PM Modi has been awarded in recognition of efforts in giving “a big boost” to bilateral relations between both the countries. The ‘Order of Zayed’ is the highest civil decoration instituted by the UAE. ‘Zayed’ is the founding father of the United Arab Emirates. It is awarded to Heads of Government/Head of State for their international relations with UAE. They are also known as longbilled vultures (Gyps indicus). It is the smallest of the vultures. Feed exclusively on carrion, and mainly remains of cattle. Listed under the ‘critically endangered’ category by the International Union for Conservation of Nature (IUCN). Vulnerable to poisoning by Diclofenac. How is democracy being viewed today? Periodic elections, party-based competitive candidates, and universal adult franchise have turned out to be the primary ingredients of democracy. This common sense has come to cloud everything centrally associated with the idea of democracy in general and constitutional democracy in particular. Reading elections as democracy has also led to the equating of means with ends, celebrating the former, and abdicating it from all responsibility the latter demands. It tends to suggest a view of democracy in which the role of the masses decidedly ends at the hustings. This reduction of democracy to elections, today, threatens to undermine the core aspirations associated with it. Why Elections alone cannot be termed as the sole conveyor of democracy? Elections can hardly be termed as the sole and effective conveyor belts of popular will in India any longer. The hype that has come to surround elections, the resources that it calls for, the close monitoring of the voters by boxing them in social straitjackets, and the media’s obsessive focus on elections as a gladiators’ den have deeply compromised elections as the preeminent device of representation of popular will. The trustworthiness of the election machinery alone cannot ensure that the voter is enabled to make a deliberated choice of momentous significance to his everyday life, opportunities and access to resources. Political parties with their stakes, almost without exception, have increasingly tended to fix the voters in social silos, rather than help them redefine their affiliations and connect to the wider social ensemble, if they choose to do so. Redistribution of resources and opportunities has been lost in the endless litany of promises of goods and bounties. A promise, here and there, in the manifestoes of political parties that allude to redistribution sounds theatrical before their socially conservative stance. Sections of the media have come to play second fiddle in amplifying the sound-bites of political leaders, deploying them to construct and reconstruct opponents, with specified social constituencies in view. They have found jingoism and archaic frames easy to stoke rather than nudge public sensitivity to reinforcing the democratic temper. Certain inheritances, beliefs, memories and shared practices can be a great help in this direction, but it is also important to realise that they can be equally divisive. India’s constitutional layout and public institutions can extend much support in streamlining and directing this political project, but cannot be its replacement. Auditing the election promises of political parties, extending support to some measures and rejecting others. schools, strengthening public health systems, public transport, entrepreneurship and skill development, universal social insurance, and reaching out to those who suffer disadvantages in accessing these measures are definitely in synchrony with the democratic project. At the same time for a large number of Indians the beliefs they uphold, and the practices that ensue therefrom are central to their idea of themselves. There is no reason why India’s democratic project cannot encompass such embeddedness and aspirations. There is a dire need to create a helm to focus on India’s democratic project.